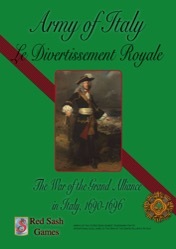 Army of Italy (AOI) is the twelfth volume in the Lace Wars™ series and the second in a set of four dealing with the War of the Grand Alliance (1688-1697). This war, sometimes called the War of the League of Augsburg or the Nine Years War, was the second of the three great wars of Louis XIV. As a young man he waged the Dutch War to expand France's borders. This was a war of aggression. As an old man he fought the War of the Spanish Succession to put his grandson on the throne of Spain. Despite the King's ultimate aim this was a defensive war. The War of the Grand Alliance was Louis' war of middle age - a war of grinding attrition involving nearly a million men. The war opened in Germany, but the Habsburgs, France's Great Enemy, also owned, or had suzerainty over, much of northern Italy. Coalition forces in Italy were weak, the Habsburg Emperor more concerned with his ongoing war against the Turks. However, the French could not spare many regiments for a second front. But, in 1689, the Spanish Habsburgs also declared war on France, fearing for their lands in the Low Countries. Unfortunately, this put their northern Italian possession of Milan squarely in King Louis' sights. This was a place the French felt they could take, but they would have to be quick about it. There was one potential obstacle: the House of Savoy. Duke Victor II Amadeus was a French puppet. But, he was also a vassal of the Emperor. And, he coveted Milan for himself... The French planned to cross the Duke's lands, which straddled the western Alps, and launch their invasion of Milan from that state's borders. The mistake King Louis made was to assume Duke Victor would obey his will regardless of how he was treated. The arrogance of the French soldiers and their king combined with Duke Victor's self interest and Coalition gold to push him into the Allied camp. He refused access to the French and found himself at war with them. The Duke was a complex character. Young and valiant, he desired glory over the French in battle, but soon found himself outmatched while his allies proved unreliable. Yet at the same time, he understood how to dissemble and manipulate. What he could not achieve on the battlefield he accomplished in a backroom deal that bought him not only a separate peace with France in 1696, but command over the very French army he had been fighting for the past six years! It was he who led the invasion of Milan! The war in Italy typified military campaiging in this period. Thwarted in their plans to invade Milan from Piedmont, the French attacked Duke Victor, spilling out of the alpine passes and across Piedmont. But, they could not establish a permanent base and had to withdraw. This flow and ebb was a feature of the early years. Sieges and battles were fought but none brought a lasting advantage to either side. In 1692 the Coalition in turn invaded France but found themselves plagued by the same problems that had beset the French. By 1694 the situation was deadlocked, both militarily and politically. However, on the political front, Duke Victor and King Louis were gradually approaching an accomodation. In 1695 the Sun King at last made some hard consessions. The following year Europe was shocked to learn Duke Victor had changed sides. His defection began the rush to peace, as the Powers tried to obtain the best deal possible for themselves. In Army of Italy, you will have a chance to change history - and even if you cannot, perhaps you can win enough glory to write your name in the history books. As the French, will you steamroller your ungrateful puppet state or simply make life so uncomfortable that she decides to join you after all? Then, the invasion of Milan can begin. The French Army is state-of-the-art. You have more artillery, the latest equipment (bayonets instead of pikes), and access to an administrative machine capable of supporting nearly 500,000 men. But you command a secondary front. Versailles will forever be taking regiments away from you, forcing you to rely on your wits. If you garrison every post, you will be too weak to go on the offensive. If you do nothing, you will lose the respect of the Sun King and the Court ladies. 1) Five map sections representing the region of the Maritime Alps and the upper Po Valley at one league (4 Km) per hex. The fifth map shows the main area of conflict, allowing players to dispense with some of the maps for most scenarios, in case space is at a pemium. 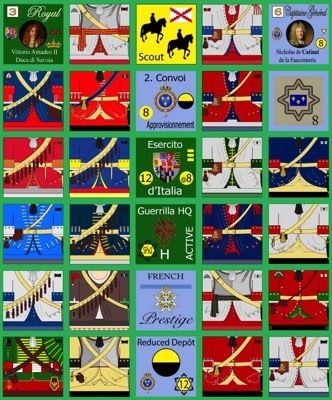 2) 840 die cut counters representing the forces of the French and their opponents - Savoyards, Huguenots, Waldensians, Spanish, Austrian, and German. Scale is Battalion - that is, the playing pieces represent battalions and regiments.